MTBoS Mission #6 | Go to Sleep. Study. Mathinate. I keep getting farther behind, but I think anyone in education knows that beginning-of-quarter/holiday season is crazy. Per Mission 6, I am definitely loving all the MTBoS goodness going on. My feed reader of choice is InoReader. I have a Feedly account, too, but I am not here for their search being a paid feature. I am a poor teacher / graduate student, so I am happy to say that InoReader has search available for free (Google Reader, it must be said, still stands as the best, RIP). It may not be as snazzy looking as Feedly, but I find that the Light Theme with Modern Blue icons looks just fine. I forget how many feeds I follow – something like 70? – but of course, they don’t all update frequently. I still get excited when I see that I have new posts to read. I don’t keep a virtual filing cabinet. I keep links organized and tagged with delicious, which was thankfully spared a fate similar to Google Reader’s. When I was still in college (2008), my educational technology professor had us all create accounts and I’ve stuck with it ever since. If I think there’s any possibility that I will ever use any files, I download them and keep them organized in a hierarchy of folders. Also, very importantly, these files are all saved in Dropbox because I had a scare my first year teaching and fear losing everything. 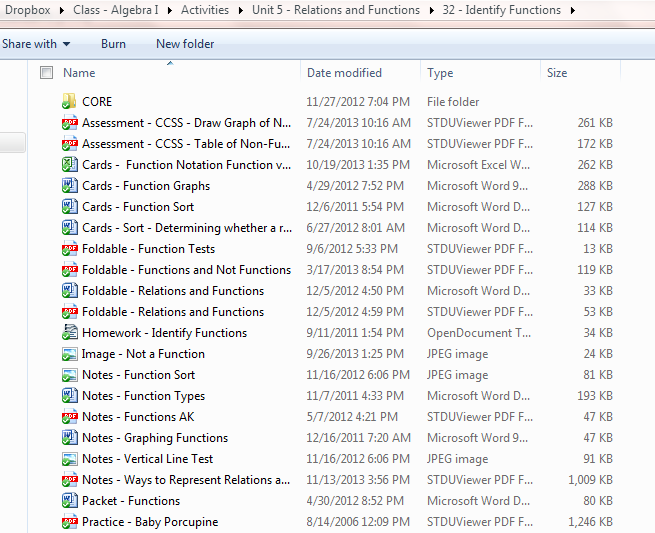 There’s folder for each class, subfolders for each unit, and then subfolders for each skill. And all files are sorted by type with a prefix in their names. This year I’ve been trying to be better about deleting junk that I’ll never use, but I admit that I hoard files. For everything I print out and laminate (card sorts, scavenger hunts, bingo cards, etc. ), I’ve started organizing by filing cabinet. I bought hanging files and hanging pockets to hold everything (units organized by color and using the included plastic labels). This is a work in progress, but it’s making everything much easier. If there’s anything I could go back and tell my first-year self, it would be to buy a laminator then and use it constantly. This is my first year with it and it’s glorious. Theoretically, I also keep binders organized by class and unit to keep masters of everything I print out during the year (in plastic sleeves, too), but honestly, I stack all the masters in a pile near my desk instead. I don’t think I’ve updated a binder since September. I guess I can’t have it all. Wow! Your system sounds very organised – brilliant! I use delicious as well, as I have done for years. I need to get myself a dropbox though as my hard drive is on its last legs! Thanks for sharing I enjoyed reading your blog.